Ocular melanoma is a rare cancer, with approximately 600 people being diagnosed each year in the UK. There is no current cure for ocular melanoma and many people feel isolated as little is known about their condition. The “I Patch For” campaign aims to change this. It is an awareness and fundraising initiative for both individuals and organisations. It runs from Friday 10th May – Friday 17th May 2019, to highlight the importance of regular eye testing. To raise awareness of the importance of regular eye examinations. To encourage as many people as possible to book an eye examination for themselves and their families. To reach people living with ocular melanoma that do not know about OcuMel UK. To fundraise for a Nursing support team, with the aim of this role providing information and training about ocular melanoma to medical professionals and opticians. To increase earlier detection of other conditions leading to more successful treatments. 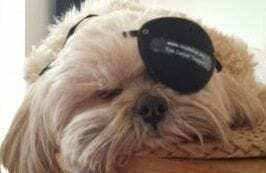 Individuals affected by ocular melanoma will choose a day to wear an eye patch. They will also show who they are ‘patching for’ with one of our badges.